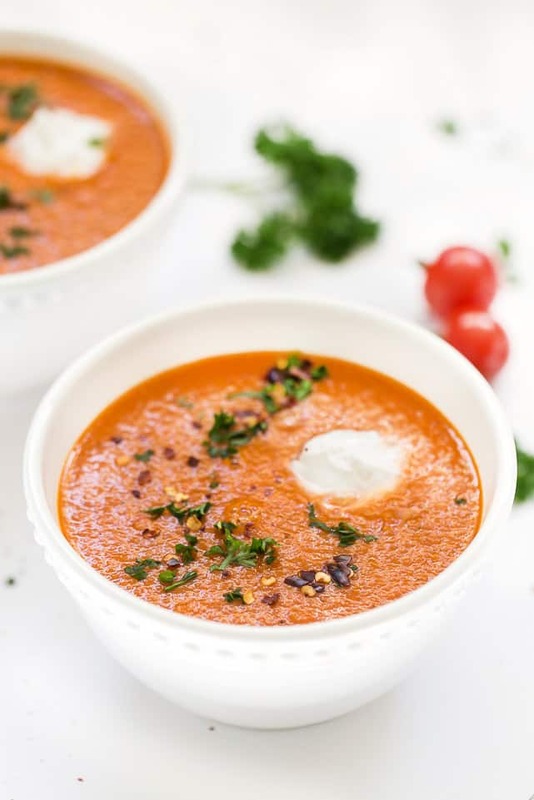 This healthy roasted red pepper and tomato quinoa soup is ready in 30 minutes, is packed with nutritious ingredients and has the perfect creamy texture! It's soup season and I'm one happy little camper. There's nothing more comforting than a steaming bowl of soup on a cold fall night. It warms the soul, nourishes the body and is the perfect way to wind down at the end of the day. 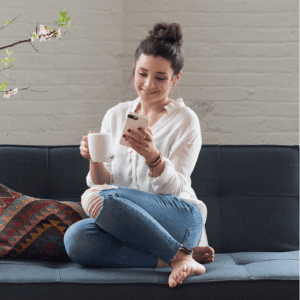 When I first started this blog, back when it was called Queen of Quinoa, I did a 21-day cleanse program that consisted of a lot of liquid meals. Soups were a staple for me and as such, I have a bunch of outdated recipes in the archives in desperate need of an update. 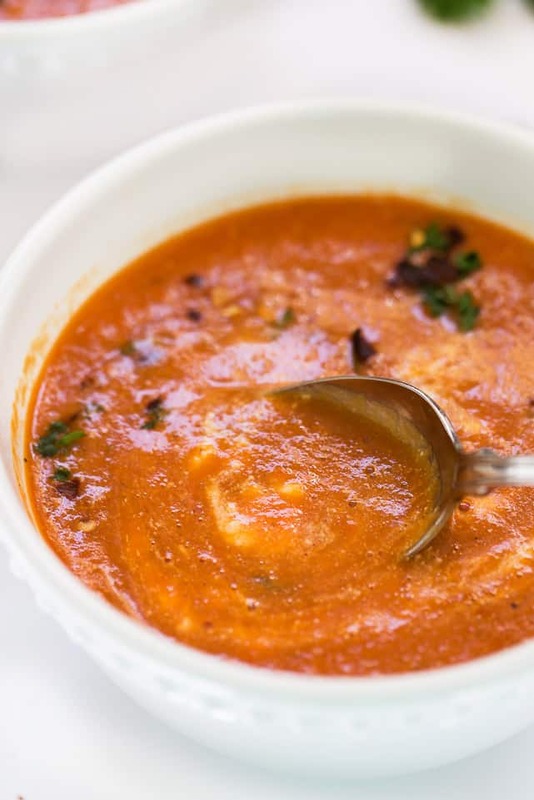 This Roasted Red Pepper + Tomato Quinoa Soup was one of them. The photos were a bit lackluster and I also changed up the flavors a little bit. But the base still remains…homemade roasted red peppers. Sounds tricky, but honestly SO easy. 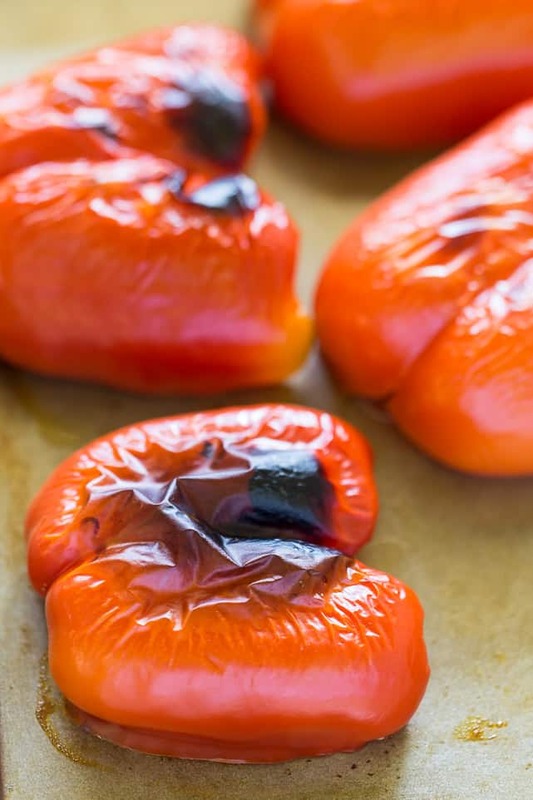 You just broil them for about 10 minutes and you have perfectly roasted red peppers. Cheaper than the jarred variety and no added oil needed! From there, we just let the soup do its thing in the pot. And while it simmers away, building up all those luscious flavors, you can do your thang! Do a face mask, drink a nice glass of red wine, read a book or just hang with your love. Hands off dinners are THE BEST. Yes, I said dunkalicious. And yes, that's definitely at the top of my list. A dunkalicious soup is probably one of the best things ever. Dunk in a piece of toast or a grilled tomato sandwich? It's the perfect combination! 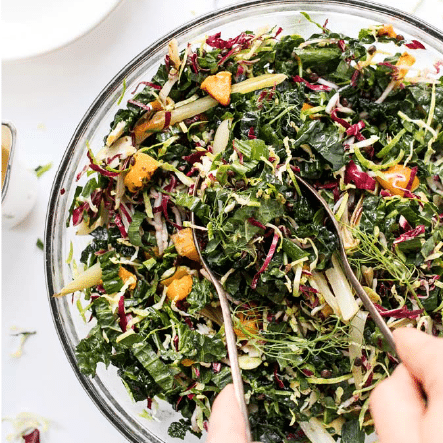 And I know you're going to absolutely love this recipe! 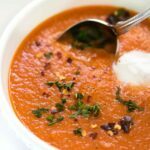 It's a twist on a traditional tomato basil soup, using roasted red pepper for a smokey flavor, a mix of dried herbs for a bit more zing, and quinoa for added thickness. 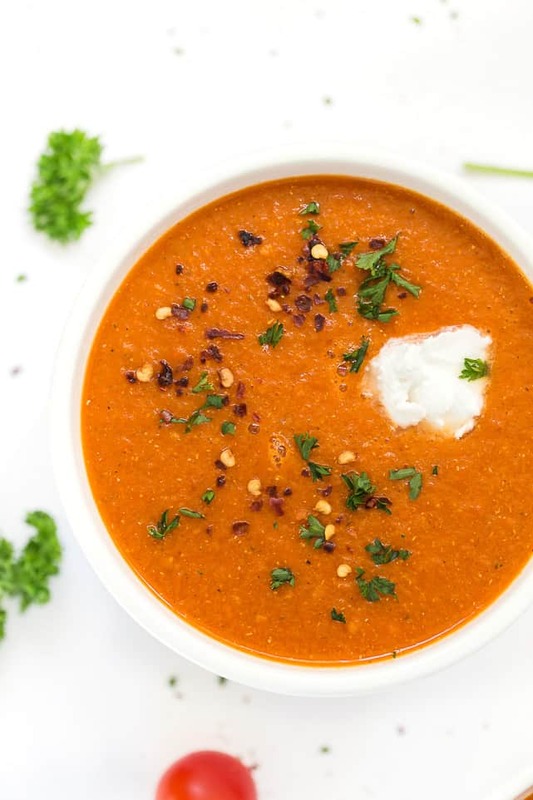 The result is a seriously delicious soup, that's healthy and packed with nutrients. 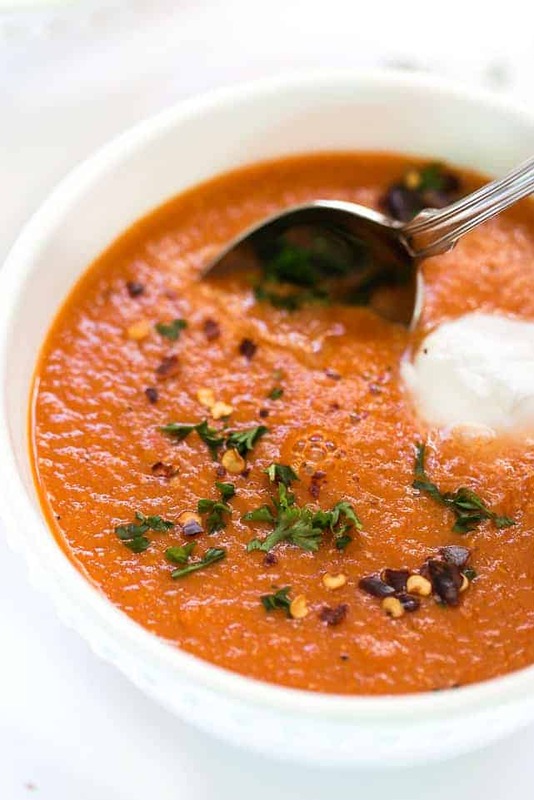 Want even more cozy fall soups? Watch this video! Turn on broiler and flatten the seeded peppers, skin side up, on a cookie sheet. Roast for about 10 - 15 minutes, until the skins are blackened. Remove from the oven and immediately place the peppers in a resealable bag. After 15 minutes, remove the peppers and rub off the skin. Slice into 1” pieces and set aside. Heat oil in a large saucepan over medium-high heat. Add onions and garlic and sauté until the onions are translucent. Add tomatoes, red peppers, vegetable broth, quinoa, herbs and spices. 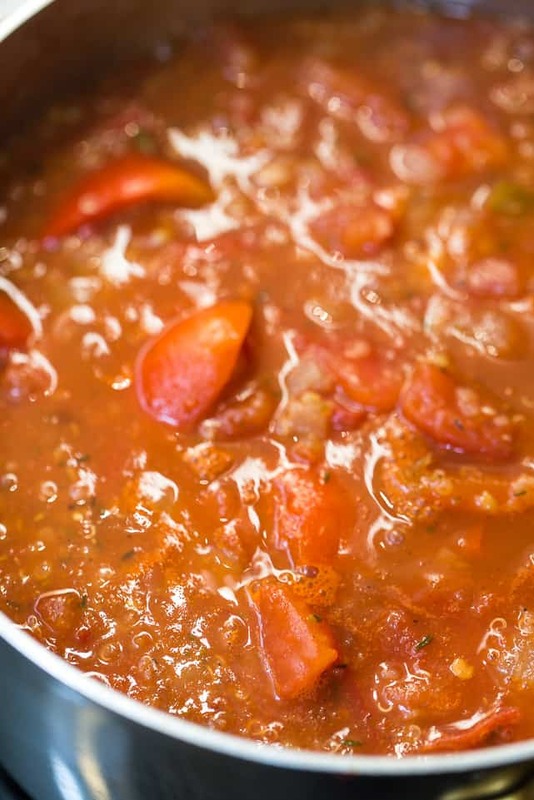 Bring the soup to a boil and reduce heat to simmer. Cover and cook for 20 – 25 minutes. Remove soup from the heat and blend with an immersion blender or in a high-speed blender (in two batches), until smooth. Stir in hot sauce if desired. Just made this soup and it has turned out delicious. I had to make a few adjustments- I used one red and one green pepper, I used dried quinoa instead of cooked and I also threw in lots of cherry tomatoes as had these left over in fridge and they were starting to soften. I didn’t have tinned tomoato sauce so used a tin of chopped tomatoes instead. The soup turned out perfec and can’t wait to make again! Oh one last thing I didn’t peel the peppers…. Sounds incredible! Love the addition of green better 🙂 Thank you so much for sharing! 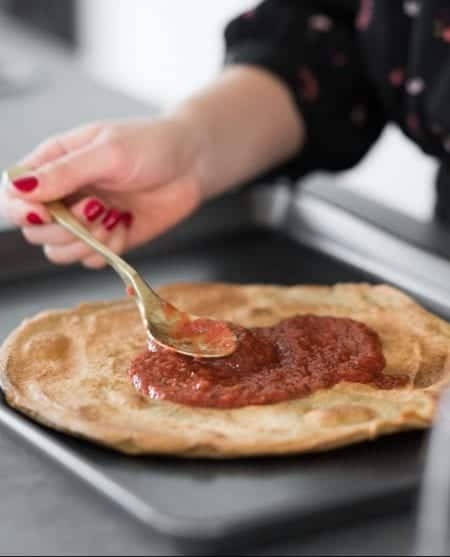 Love your new web design, all of your videos and recipes but sweetie, please don’t tell people to put hot food in a plastic bag as you did with the red peppers. I accomplish the same thing by using a glass bowl and a tea towel. No nano-micro-plastics in my food. Hi this soup looks great. Wondering if anyone has had good results freezing it? Would be nice to have a good supply on hand. So who makes a soup from scratch in the beginning of summer? I did!!! This soup is sooo good. I didn’t blend it completely because I like a little chunk in my soup but it was good. I’m not a pepper (spice person) so I would probably back off the red pepper a bit. Thanks for the recipe. I am looking for to adding this to my winter meals. 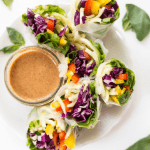 Excited to try this recipe! 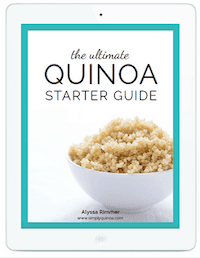 I’m curious if there’s any reason not to increase the liquid and cook the quinoa in the step 3 rather than using already cooked quinoa? I’m also thinking of using canned tomatoes, do you know about how much canned I would use for your 2 tomato equivalent? Trying to save myself any extra steps I can! Thanks for this recipe! Made this soup – absolutely delicious! Made this soup tonight and it was super delicious!! I served it with a little sour cream and some Parmesan cheese..
Really tasty soup, made it last night. I didn’t roast the peppers exactly as per intrusions and omitted the quinoa, but it was so tasty!! Thank you! Oh! This soup looks and sounds perfect! Made this and it was absolutely delicious! I highly recommend it! I halved the recipe, and only had half a red pepper and half a yellow pepper from a previous night, so I used those. It still came out nice, red, and tasty. I found this recipe on pinterest and made it today. It was pretty easy and is spicy and delicious! I didn’t even add the milk and I’m not going to because I like it just the way it is. My soup turned out much lighter than your dark-red soup picture but it’s still fantastic! Thanks! So happy it worked out for you Marianne 🙂 I also love the spice factor! I was just thinking about this soup yesterday. I think I need to make it again! looking for healthy and of course tasty food ideas,and staying away from wheat . I can’t see the recipe for this soup anywhere! please help I’d love to try it. So glad you like the sounds of the soup 🙂 It’s actually being featured on the Easy Eats blog, so if you follow the link at the end of the post, it will take you directly to the recipe. Yay! That just made my day 🙂 So happy you enjoyed it!! Im making soup today too! This soup looks amazing and I am with you, I can’t get enough soup once fall hits. I have been dreaming of lots of different soup concoctions already. Off to check out that recipe now.